With huge and heartfelt thanks to our volunteer gala committee, we can officially say this year's event is a wrap. Please enjoy this recap from the Severna Park Voice right here, and if you haven't already done so, check out the link to photos on our event blog! See you next Spring, SP! ​Building community is what we do here at SPCC, and we are so proud that Larry supports the Shop Local movement right here in our hometown. Dust off your dancing shoes, SP! "The motion of this place, the rhythm of this place is so much fun!" What a great quote this is from our new Executive Director Sarah Elder, as interviewed in the Severna Park Voice! We are grateful to the Voice for their continued support of the Center, and so enjoyed their profile of Sarah as she hits the ground running here. ​If you happen to run into Sarah during your visit to the Center, please say hello! She looks so forward to meeting our community here at SPCC. You can enjoy the full article right here. If getting healthier or being more active made it onto your list of New Year’s Resolutions, why not take a look at the Severna Park Community Center to see how we can help? We have programs and activities for folks of all ages to not only get moving, but also have fun while doing so! Personal Training and Group Fitness Classes: This is an exciting time of growth for the center as we introduce you to our newest trainers, Christi Darcy and Dana Opalinsky. Both of them offer a drop-in rate of $15 for their classes and are also available by appointment for personal or small group training. Please meet Christi and Dana right here and check out their class schedules. Pickleball: join us on weekday mornings in the gym for this round-robin style action game. Pickleball is played with a paddle and a wiffle ball and looks a lot like tennis (although is scored like badminton). We have several dozen regular players who welcome rookies with open arms. We’re a friendly bunch! Come give us a try. You can see us in action right here and find our winter schedule as well. Swimming: Even though we are facing a “bombogenesis” of winter weather this week, it’s always warm on the pool deck! Why not try some adult swim training or tackle Master’s Swimming, both of which you can register for right online. Our first winter sessions of Adult Swim Training starts this weekend, and soon our little guys will be in there for lessons as well! 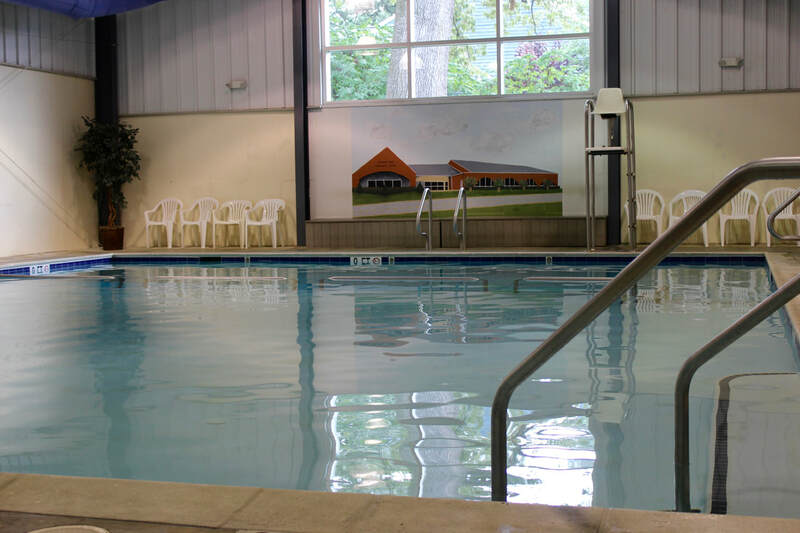 If training isn’t what you’re looking for, we have all kinds of aquatic wellness programs in our Therapy Pool. Wellspring brings together therapy, aquatic exercise and lectures, with an ever-evolving list of offerings. Please visit our Wellspring page for descriptions and schedules to see what works for you. Occasionally, we host a lecture series by Anne Arundel Medical Center, and next week’s lecture is “Healthy Eating in the New Year”, which we probably all need after a few weeks of holiday excess! Dance: Dance is not just for kids at SPCC. We have Adult dance lessons in ballet and tap, with our new Winter session starting at the end of January. Check out the calendar and register right here! We have all kinds of ways to stay active (indoors!) at the Severna Park Community Center. Please stop by and visit our friendly front desk staff to see how we can get you moving this winter. Get ready to move, SP! As the leaves fall from the trees and summer fades away, autumn comes as a time of reflection. I think about how fortunate we are to be a part of this great community and how blessed we are to be supported by wonderful friends and partners. On behalf of The Board of Directors, I want to thank you for your loyalty and dedication this past year. Fundraising is a requirement for the Severna Park Community Center to provide the level of service we all enjoy. To be more specific; our annual revenue is approximately $1,600,000 and our annual operations are approximately $2,000,000. The approximate $400,000 gap is where we rely on our fundraising efforts. The Friends Campaign is a primary annual fundraiser for the Center. The Center has flourished under your care and financial assistance. Countless children and adults have been able to partake in our programs which not all communities are fortunate enough to have. Kids of all ages can forge friendships, learn the benefits of hard work, and most importantly, grow in a fun and friendly environment. Adults and seniors can socialize, stay active, and remain vibrant with our adult community activities. Your continued generosity and support are the entire reason that our beloved Community Center is possible. We respectfully ask you to consider the Severna Park Community Center and make a tax-deductible donation to SPCC. As a non-profit, your gift is essential to our continued growth. Your gift will make an immediate impact on the daily operations of SPCC and allow us to take the Center to even greater heights, positively impacting lives in Severna Park and its surrounding neighborhoods. Thank you for helping the Severna Park Community Center continue our work throughout 2018. We are happily reviving some of our favorite events from last December! Please make some time to come by the center this holiday season to share some time with friends (and maybe make some new ones). We have a singalong story time coming up with Santa on December 15th, which will be a busy day here at SPCC! Maybe you have a tiny future ballerina who might like to go to Dance and Play first (9:30) and then come upstairs to the party (10:30)? Later that day, we have the Scouts here hosting their holiday giving tree- a perfect way to set an example of holiday service to those in need here in our community. Finally, you've surely noticed that we have a new online look and feel. We are so excited to move The Center forward and consolidate our 3 legacy websites into one new home! Please be patient with us as we explore our new online registration process in aquatics and dance- registration is now open (and automated), but we always accept registrations at the front desk as well. ​See you at the Center, SP! Have you SEEN the pool lately? 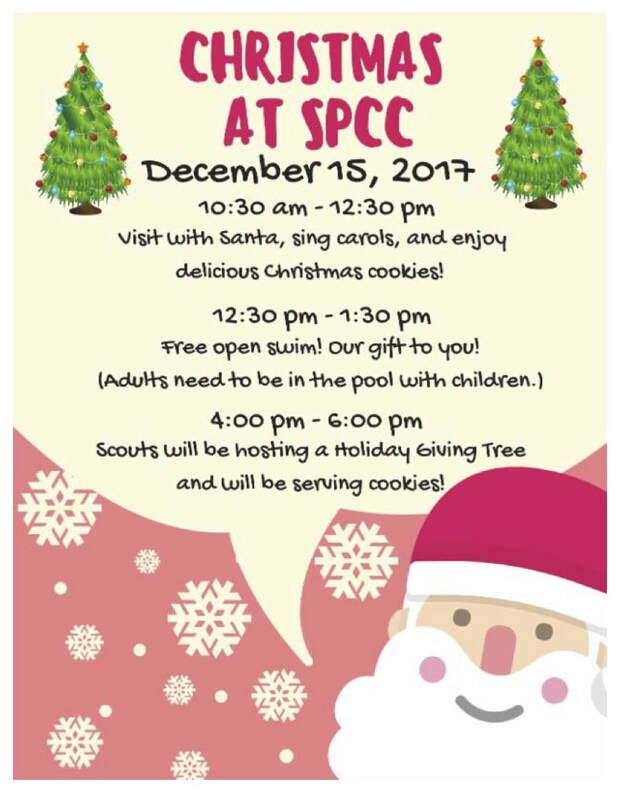 SPCC Aquatics is bursting with good news! The whole aquatic center received a mini facelift during annual maintenance. The Therapy pool was drained and professionally cleaned by Anchor Aquatics. The main pool deck, beams, cross bars, walls, doors, ceiling frames, lockers, and womens’s showers were repaired, where necessary, cleaned, prepped and painted. The deck was professionally painted by Bob Stewart and Mike Brown, the women’s showers and ceiling frames by Chesapeake Painting, and the rest was taken care of by the awesome aquatic staff! The ADA Chairs and Therapy Pool booster pump were repaired and program equipment sanitized. We are thrilled with the facility! We are genuinely excited to announce the addition of some extremely experienced and talented aquatic professionals to our staff! SPCC welcomes Gladney McKay who joined the SPCC staff as the SPCC Maryland Master’s Head Coach. Gladney, a long time swimmer and master’s and age group coach, arrives with a wealth of experience and knowledge. She and Carolyn Voorhees, with Coach Diane, Chris, Jill, and Mike, are looking forward to a successful year for the Master’s swim team. Whether you are a novice swimmer wanting to get in shape or an experienced swimmer wanting to sharpen your strokes with an eye towards competitions, there is a place on SPCC Maryland Masters for fitness, improved swimming, and camaraderie. Registration is ongoing throughout the year. Veteran and beloved Age Group, Summer, and High School Swim Coach Mike McTammany, is leading the High School Swim Season prep program. After helping swimmers get ready for their high school swim season Coach Mike will be on deck with many of the other SPCC Swim Training programs. Carolyn Voorhees, along with her coaching staff of Reid Hussey, Maile Johnson, Ryan Maloy, and Josh Hanson welcomed 44 swimmers to the start of the Intramural Swim Team season. While the first session is full, there are openings in the second session. Registration for the Spring sessions will open in November. SPCC is grateful for such a talented coaching staff. Coach Carolyn is a veteran club, summer, master’s, and collegiate swim team coach. Reid, Maile, Ryan and Josh are all decorated swimmers who have spent their summers coaching summer swim teams and have now joined the ranks of a year around coaching staff. On the Wellspring front, Dana Opalinsky, joined the staff as an Aquatic Rehabilitation Specialist. This fall Dana is teaching Aquatic Yoga on Wednesday at 11. Aqua yoga can be practiced by anyone, but is especially beneficial for those who are unable to exercise on land. Kendall Casper, is our new dynamic swim instructor and specializes in teaching learn to swim classes. She is phenomenal with young children! We are so grateful for the talented leadership of our new Aquatics Director Shelly Beigel here at The Center, along with her growing staff, as we strengthen the entire aquatic presence of SPCC. Come see us at the pool today! Priority 1 brings their sound to the front porch of Holy Grounds! We launched a new community event last night with Rock The Park, sponsored by the David Orso Group. What a great night we had! The fun kicked off with Fast As Lightning, a great hard rock band whose musicians are all local teens and tweens. They sure brought the "rock" to the Park! Then, we enjoyed some Dixieland music from Priority 1, who shared their unique & polished sound with us for about 45 minutes before the rain clouds opened up on The Center. We are so grateful to local restaurants like Garry's Grill and Firehouse Subs for feeding our crowd at this inaugural event. And we relied on the service and support of dozens of others to offer face-painting, balloon animals, carnival games and more as we raised money to spruce up Holy Grounds. You know who you are, volunteers, and we so value your presence. At SPCC, we work hard to bring the concept of "community" into the Community Center every day. This fun and festive concert gave us a great chance to spend casual time with our neighbors, programmers, customers, and friends on a warm summer night. Thanks to our local friends who joined us last night, and we hope to see you back on September 29th to enjoy the sounds of the Woods Church Praise Band. Enjoy these waning days of summer, SP!